Superionic Water: What is it? Imagine if water could be liquid and a solid, without being frozen. Scientists think that this substance could exist on two different planets, Neptune or Uranus. Water is made up of three molecules, two hydrogen molecules, and one oxygen molecule. The hydrogen molecules attach themselves to the oxygen molecule, forming a v shape with two hydrogen molecules on top and one oxygen molecule on the bottom. "Normal water" simply has two forms, solid and liquid, also known as ice and water. Freezing "normal water" makes a solid and melting the solid makes a liquid. This new form of water is a substance that scientists call superionic water. Superionic water is the latest advancement in water studies. Superionic water is a type of water that can simultaneously switch between solid and liquid. It is made of a rigid lattice; the lattice is made up of oxygen molecules with positively charged nuclei moving freely through the lattice. Dr. Marius Millot and some of his colleagues at the Lawrence Livermore National Laboratory in California have done several experiments with this new form of water. First, they squeezed water between diamond at 360,000 pounds of pressure per square inch. After that, the ice turned water is shipped to a different location by plane, and is blasted by a laser that heats up thousands of degrees a second. The superionic water is solid at this state and turns to liquid at 8,500 degrees Fahrenheit. These circumstances exist on Uranus and Neptune. Scientists think that the superionic ice may explain the lopsided, off-center magnetic fields of Uranus and Neptune. Superionic water is a form of water that has two states of matter: solid and liquid. What makes it unique is that it can switch between the two states of matter. 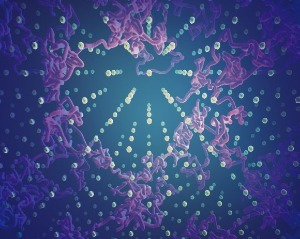 This research suggests that scientists are starting to understand the basic physics of how molecules behave under changing temperatures and pressures for practical use. This increased understanding may mean that one day, scientists may be able to engineer new materials, depending on what properties are needed.